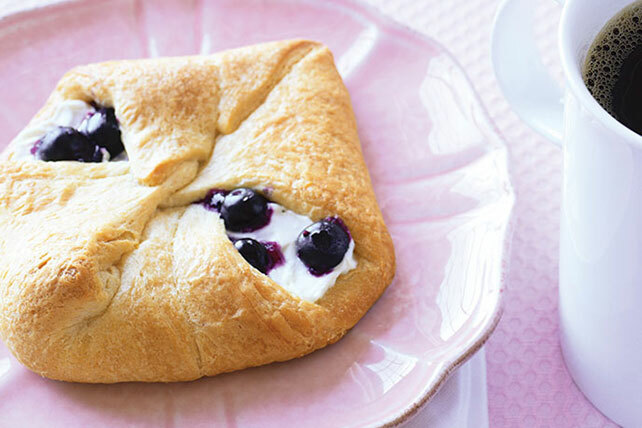 I am all about the cheese Danish and I have to admit a particular fondness for blueberries. Finding a blueberry cheese Danish? Yeah…not so easy. Guess what? This recipe is so easy I snatched it up immediately! Skip the plastic-wrapped cheese Danishes. These creamy, fruit-filled rolls are way better—and they prep in just 10 minutes! Unroll dough onto work surface; separate into 4 rectangles. Firmly press perforations and seams together to seal. Mix Neufchatel and sugar until blended; spread onto dough rectangles to within 1/2 inch of edges. Top with blueberries. Bring opposite corners of rectangles together; press together to seal. Bake 11 to 13 min. or until golden brown. I have the feeling these treats are a staple in the Connor household in Blaidd’s Gap. Jacey can whip up a batch fast and they’re hearty enough for Nate and gooey-sweet enough for Hope and Grace. 😉 You can read about Nate and Jacey in HUNTER’S MOON or more of their story in MOONSTRUCK: LIES. You can go directly to Kraft Recipes to bookmark the recipe by clicking HERE. This entry was posted in Writing Life and tagged food, good stuff, links, recipe, Tuesday Treats. Bookmark the permalink. Growing up we made something similar. We’d mix a cup or two of blueberries into the cream cheese and then put a huge spoon full on a thin (not crepe) pancake and then roll it up. To top it off we’d sprinkle powdered sugar on top. This was always dinner on Maundy (Holy) Thursday. My middle son liked them for his birthday dinner too ;). Ooh! That sounds like a yummy alternative!